Several thousand migrants have fled Honduras, hoping to escape poverty, violence, and repression. Donald Trump and his fellow nationalists and racists have been fearmongering about this so-called “migrant caravan” in hopes of mobilizing their base to vote in the November 6 election; their efforts have triggered a wave of fascist violence including last week’s massacre at a synagogue in Pittsburgh. Still more troubling is Trump’s order to send thousands of US troops to “defend” against the caravan. This sets yet another precedent for the use of the military against civilian populations. 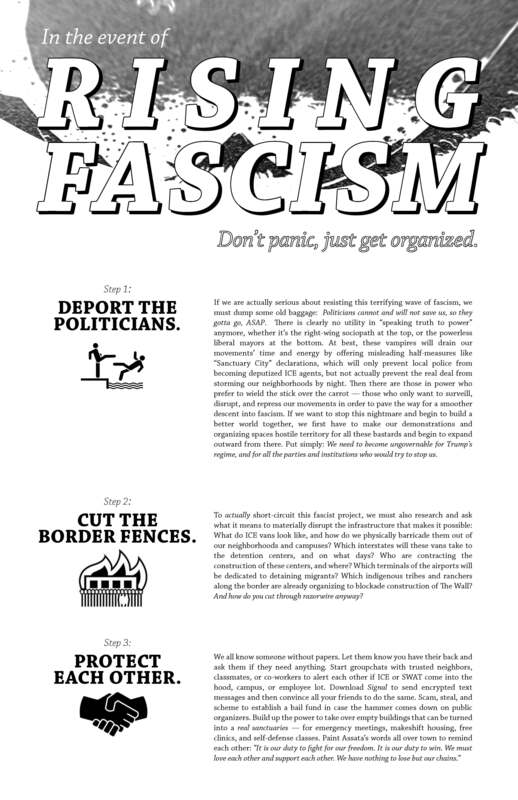 Here, we explain why everyone who is not a racist ideologue has a common stake in resisting the militarization of the border, and offer an array of options for what you can do about it. Click above for an imposed PDF version of this article for printing. First things first: why are people leaving Honduras for the US in the first place? Honduras is still suffering the consequences of a US-backed coup that took place in 2009 on the heels of centuries of resource extraction. In short, Hondurans are trying to come to the United States because the natural and financial resources of Honduras have already been looted and brought across the US border. If Honduras is in shambles, it is not because Hondurans are any less resourceful or fundamentally decent than anyone else, or even because its rulers are any more wretched and callous than our own. It is because the structure of the North American economy has made any other outcome impossible. The conditions that are forcing refugees to flee Honduras are part of a much wider pattern. In the quarter of a century since the passing of the North American Free Trade Agreement (NAFTA), globalized capitalism has inflicted grievous damage on the biosphere, indigenous populations, and workers’ rights. Industrial production has shifted to the parts of the world where labor is cheapest, while structural adjustment programs have made it impossible for governments to maintain any sort of social safety net; from the United States to Honduras and Bangladesh, this has created a race to the bottom. The combination of globalized financial speculation and militarized borders has increased the pace at which capital flows while exacerbating the ways that citizenship functions as a caste system limiting who can move freely, dividing the world into zones of exploitation and zones of accumulation. This benefits capitalists who aim to maximize their profits, but it doesn’t benefit the majority of workers—not even the ones in the wealthiest countries, because they still have to compete with workers in other parts of the world to see who can sell themselves the cheapest. In this context, it’s no longer possible for laborers to gain leverage by organizing on the level of a single factory, or even a single country; the global market simply routes around resistance to find a more exploitable population. If we want to defend our interests as workers, we have to make common cause with everyone else around the world who is exploited. That means that labor organizing has to begin by opposing the border—not just as a line on a map, but above all as a social division that cuts through the population of every country, segregating those with citizenship and travel privileges from those who are denied them. Just like racial divisions, the border serves to prevent workers from uniting to defend their interests against those who exploit them. Trump has pretended to be critical of neoliberal free trade, but in practice, he has just introduced a more xenophobic and oppressive version of the policies of his predecessors. This is the one-two punch of the complementary Democratic and Republican agendas: the Democrats have paved the way for the neoliberal order that is steadily concentrating wealth, while the Republicans are intensifying the violence that preserves that order. The Democrats introduced NAFTA, forcing millions to flee financial collapse in Mexico to seek precarious work at illegally low wages in the United States, and the Republicans are escalating police and military operations against those precarious undocumented workers—ensuring that they are divided from the other workers who would have to organize with them in order for anyone’s conditions to improve. The caravan from Honduras is nothing new—people have been fleeing to the US from Honduras and other parts of the world for decades. In fact, the undocumented population of the US reached its peak over a decade ago and has been declining ever since. What’s more, a great part of those staying in the US “illegally” are not sneaking through the desert in the middle of the night, but coming into the country via legal work visa programs, then remaining afterwards. Of those who do cross illegally through the desert, roughly half of them are longtime residents of the United States who are simply trying to return to their jobs and families. And, as has been widely documented, immigrants engage in less criminal activity than the rest of the population. So there is no migrant crisis. If anything, the fear of mass deportations has impacted the US economy, as agricultural industries that rely on migrant labor are experiencing difficulty recruiting enough workers. Trump’s rhetoric about an “invasion” requiring military intervention is blatantly dishonest. It’s obvious to his supporters as well as his critics that his real agenda here is not economic but ideological. Despite his laughable campaign promises to bring factory jobs back to the United States, Trump knew from the start that he could not build a time machine and transport the white working class back to 1950. Nor did he intend to do anything to redistribute wealth to the white working class; thus far, all his financial policies have only served to speed the pace at which capitalists like himself are plundering them along with everyone else. What he can do to placate white male workers, however, is adjust the distribution of violence, focusing it even more against people of color, undocumented people, women, and queer and trans people than it already is today. This is how we must understand Trump’s promises to “build the wall,” block the caravan, and strip citizenship from the children of the undocumented. All of these are intended to buy the allegiance of white people, even desperately poor white people, by giving them scapegoats at whom they can channel their frustration. The #MAGAbomber attacks and the massacre in Pittsburgh are not unwanted side effects, but an essential part of this program. Fascists, white nationalists, and nativists desperately need an enemy to rally people against; their false notion of community only makes sense when they can define themselves by contrast with an Other. They are pushing for “strong borders” as a way to revive identities such as whiteness and patriotism that are fundamentally based on exclusion. If the caravan did not exist, they would have to find another threat to mobilize around. Their project is not particularly popular with the majority of the population. This is why the lone-wolf killers, militias, and paramilitary outfits are necessary—not just to terrorize the opposition, but above all to shift the Overton window regarding what sort of discourse is acceptable. For his part, Trump’s strategy is always to push the envelope to see how much he can get away with. And this brings us to his order to deploy thousands of troops at the border. This signals the enlistment of the US military in Trump’s strategy to preserve capitalism by inflaming the divisions within the population that suffers from it. In the 21st century, the chief role of the military has not been to fight wars, but to carry out counterinsurgency measures. This was already clear in the wars in Afghanistan and Iraq, which chiefly pitted the US military against the civilian populations of those countries. It became clearer still when US military personnel and private contractors who had patrolled Kabul and Baghdad were brought back to the United States to occupy Ferguson and Baltimore. Just as it has been necessary to deploy troops around the world to secure the raw materials that keep the economy afloat, it is becoming necessary to deploy troops in the US to preserve the unequal distribution of resources at home. Just as the austerity measures pioneered by the IMF in Africa, Asia, and South America are appearing in the wealthiest nations of the first world, the techniques of threat management and counter-insurgency that were debuted against Palestinians, Afghanis, and Iraqis are now being turned against the populations of the countries that invaded them. Private military contactors who operated in Peshawar are now working in Ferguson, alongside tanks that rolled through Baghdad. For the time being, this is limited to the poorest, blackest neighborhoods; but what seems exceptional in Ferguson today will be commonplace around the country tomorrow. If it becomes normalized for US troops to occupy unruly cities within the territory of the United States and to intervene at the border against unarmed civilians, it will be only a matter of time before those troops are deployed against other populations as well. First they came for poor Black communities—then they came for the Muslim immigrants—then they came for the undocumented immigrants… this list will continue to grow, eventually even including white liberals, if things go far enough. The less backlash there is about the deployment of troops at the border, the faster this process will proceed. Trump and his supporters are trying to put the precedents in place for a future in which their notion of order will be maintained by open, brutal force involving every weapon and every institution of the state. Even if you don’t identify with refugees on the receiving end of colonialist oppression, even if you don’t recognize opposition to the border as a necessary step towards updating the labor movement for the 21st century, you have every reason to recognize this as your own fight. Words and sentiments are meaningless here—we have to act in solidarity with those on the other side of the border. Trump and his cronies are hoping that people will disapprove of his administration’s activities, or perhaps just vote against them, without taking any concrete action to make it impossible to implement them. But only direct action can be effective against an administration that views protests, negative press coverage, and “speaking truth to power” simply as opportunities to rally Trump’s base. We demonstrated the efficacy of direct action with the airport blockades at the opening of his term—and again, to a lesser extent, with the ICE occupations over the summer of 2018. Both served to force Trump to abandon at least a part of his agenda. We have leverage, should we dare to use it. What does it look like to resist the militarization of the border? Some may travel to the border to be there when troops are deployed, or when the caravan arrives. But the border is everywhere—everywhere that an ICE facility operates, everywhere immigrants live in fear of being snatched from their families. Even if you can’t travel, you can take meaningful and effective action wherever you are. Here are some points of departure. No Wall They Can Build: A Guide to Borders and Migration across North America— Drawing on a decade of solidarity work in the desert between Mexico and Arizona, this book uncovers the goals and costs of US border policy, and what it will take to change it. Order it here or click the image above to access the PDF. Click the image above to access the PDF in English and Spanish. You can order these stickers in bulk here. Click the image above to access the PDF. You can order these posters in bulk here. Click the image above to access the PDF. 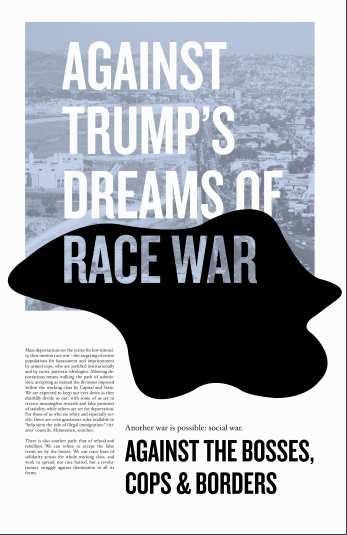 Against Trump’s Dream of Race War. Undoing Border Imperialism with Harsha Walia. November 8-11: Call for International Day of Action Against Fascism and Anti-Semitism. Called by anti-fascist Jews, this is an opportunity to link antifascist struggle against white nationalism and anti-Semitism, including recent far-right attacks across the US, with Trump’s push to attack the caravan. More information here. November 16-18: SOA Watch Border Encuentro. Called by School of the Americas Watch, this will be a mobilization against border imperialism. More information here. December 17: Meet the migrants at the border. Occupy ICE Portland: Policing Revolution? What Would It Take to Stop the Raids?—At the outset of Trump’s presidency, this article presciently proposed targeting ICE facilities as a pressure point in the struggle against the violence of the border. The White Nationalists That No One Protested—On white nationalist influence within the Trump administration. This text was produced in collaboration with our comrades at It’s Going Down.